While Kaspian was away with his grandparents last week, we asked "Kuncle" to watch Astrid so we could go to a date night. We found a groupon for Rancher's Club. We have never been there and were excited to try someplace new. We got to try two drinks, an appetizer, two soups or salads, two entrees, and a dessert. The meal took about two hours. The restaurant was not very busy on a Thursday night and the restaurant was fairly quiet. The ambiance was pleasant with a dimmer room and ranch style decorations such as antler chandeliers. There were also deer heads around and a bison head mounted over the fireplace. For our drinks, we ordered a lemon raspberry martini and a chardonnay. The chardonnay was good. The lemon raspberry martini was...mostly gin. Although the description said it came with fresh raspberries, it in fact appeared to be mostly just a glass of gin. For our appetizer, we chose tuna and beef tartare. It was...melt in your mouth delicious. The appetizer was the best thing we had there. 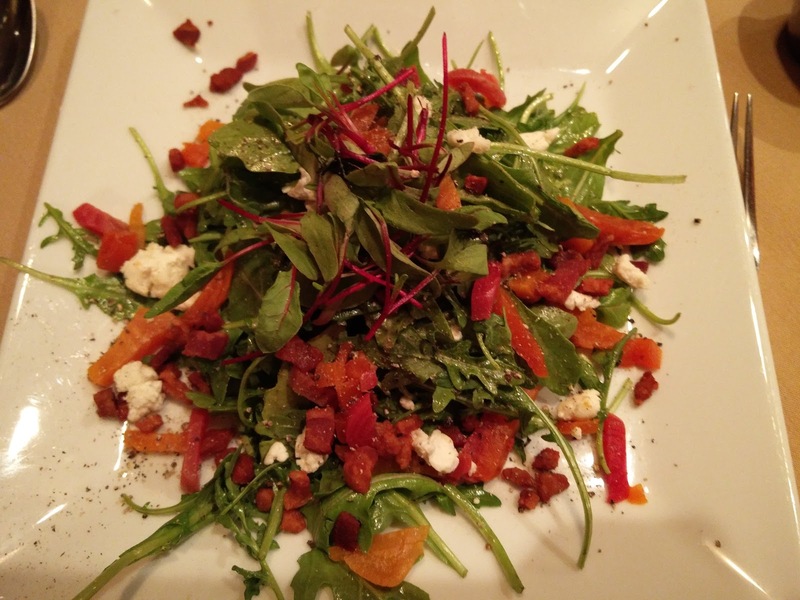 For the next course, Alona had the Rancher's salad and Nick tried the soup of the day. 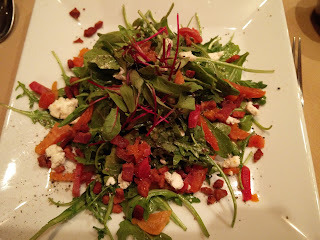 The rancher's salad was good, although on the sweet side. The beet pieces were very sweet. The bacon bits were delicious, and salty; the perfect bite was one that had lettuce, beets and bacon in it. The soup of the day was chicken orzo soup with vegetables. 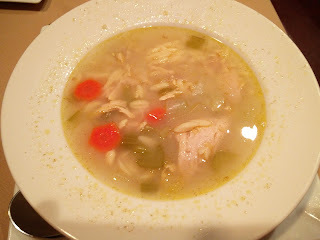 It was a very good chicken noodle soup, with the noodles being substituted with orzo. The groupon included all items on the menu except Wagyu beef. So, Alona had the Lobster tail (16oz!) with Mashed potatoes and broccoli. Nick had the Hunter's Mixed grill which included boar sausage, elk and venison. The lobster was very very good, although not the best we've had. 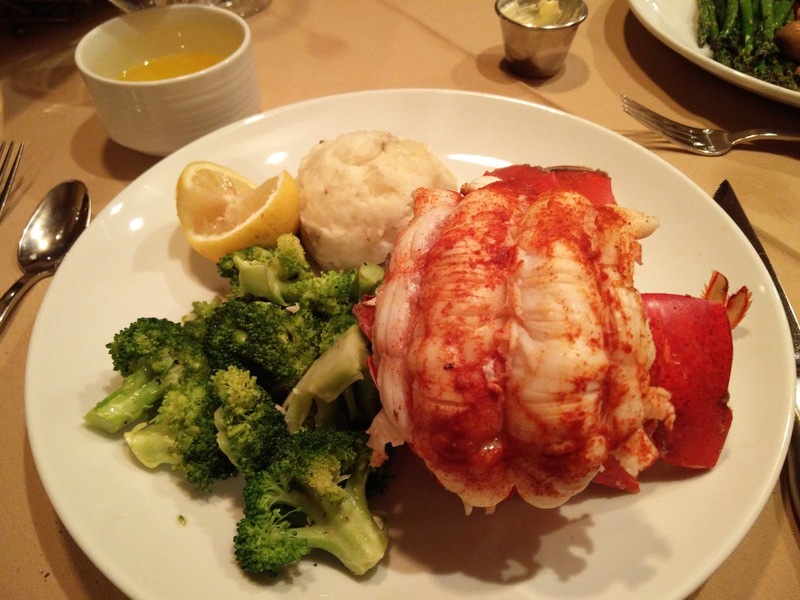 The sheer size of the lobster tail was amazing and it tasted good, but we prefer ours to be cooked a little bit more, so that it is easy to cut and is not as "tough" or chewy as some of the lesser cooked lobsters. The potatoes and broccoli were great accompaniments. Nick ordered his plate medium well. However, the venison and elk were bloody all the way through. They were seared, but the insides were completely raw. It was actually to the point where we took it home and fried it to cook it all the way through. Doing that, really helped and the meat tasted very good. 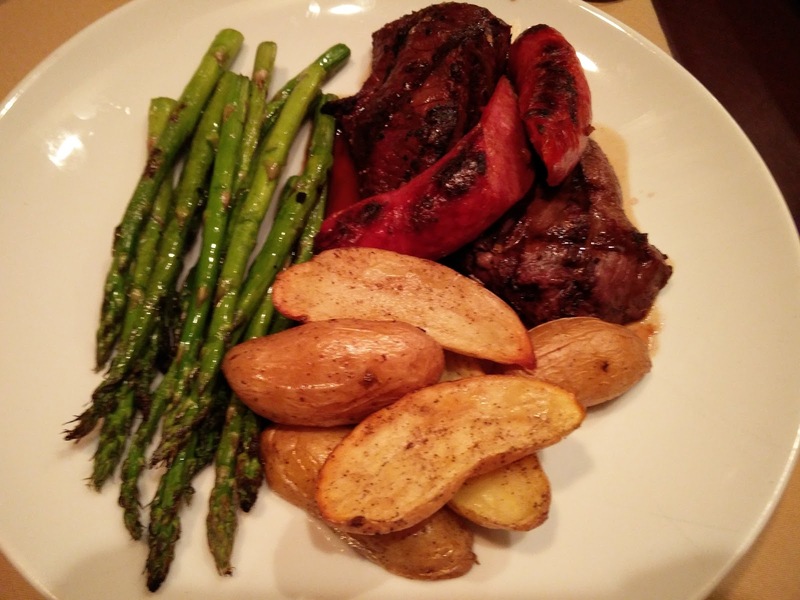 Nick's dish came with asparagus and potatoes. 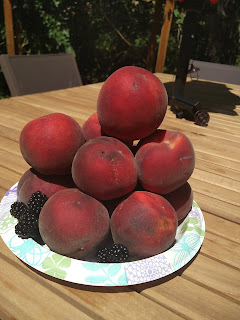 They were nothing spectacular but complemented the dish well. The asparagus seemed like it was steamed then grilled, and tasted close to what we do at home. 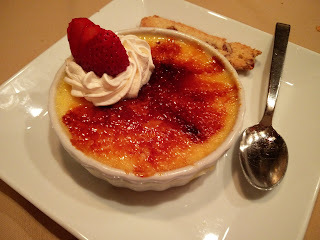 Lastly, for dessert, we ordered creme brulee. 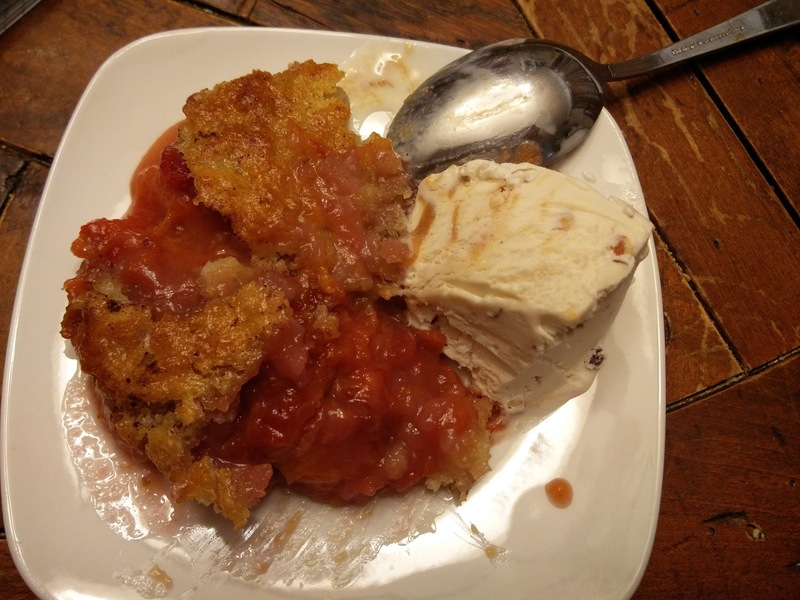 This was also very good with sugar perfectly caramelized on top. 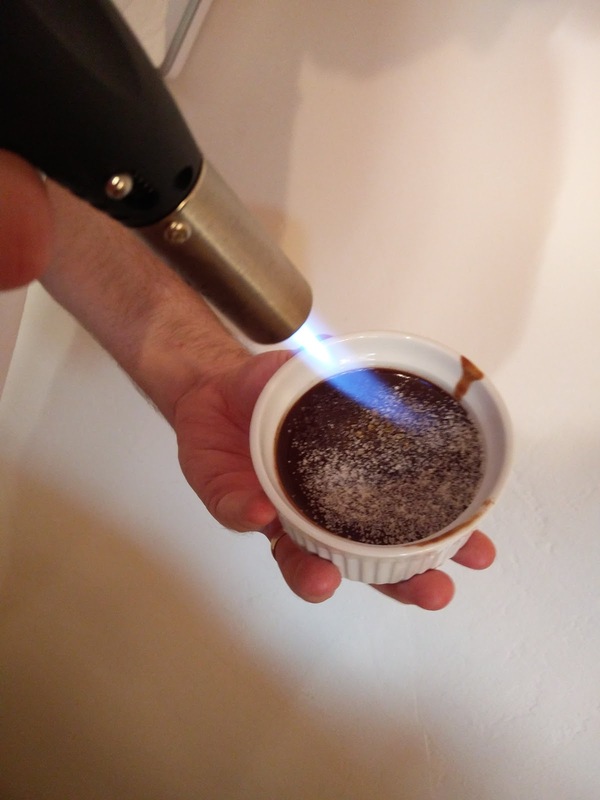 We were pleased to notice that the creme brulee we make is as smooth, and perhaps even smoother than this one. We think our creme brulee can match this one. We still need to work on the sugar caramelaziation though. 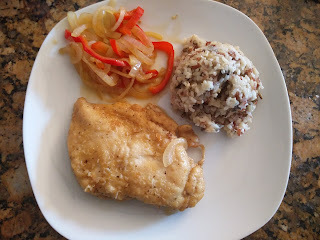 Overall, this was a really great meal, but we are glad we had a groupon for it as we don't think it would have been worth it for us otherwise. 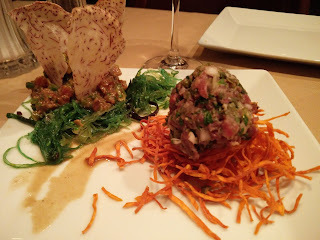 We are very happy to have tried this and it was a wonderful date night experience. For those looking for ambiance and unique dishes that most places don't have this is a great place, but if you prefer exceptional food we would recommend looking elsewhere. 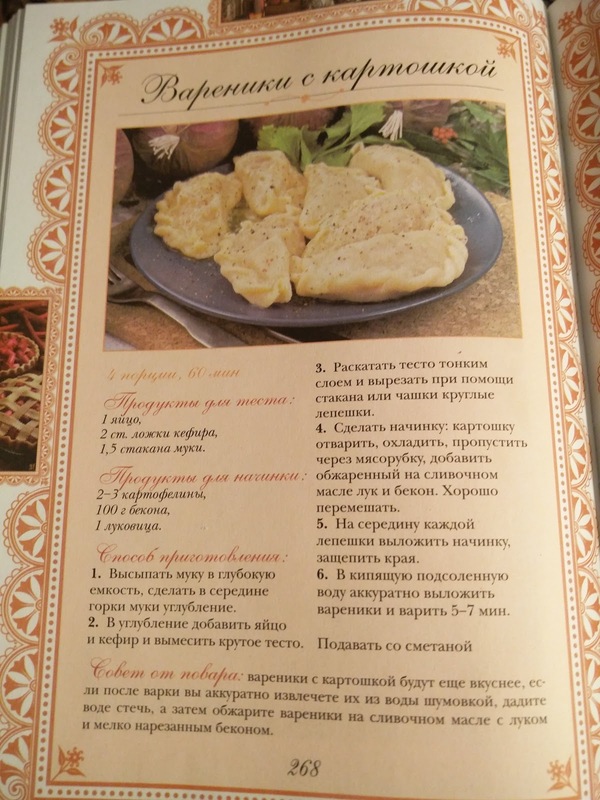 These are a traditional Russian food, close to pirojki. The dough is different however, and, they are boiled - then can be fried (optional). 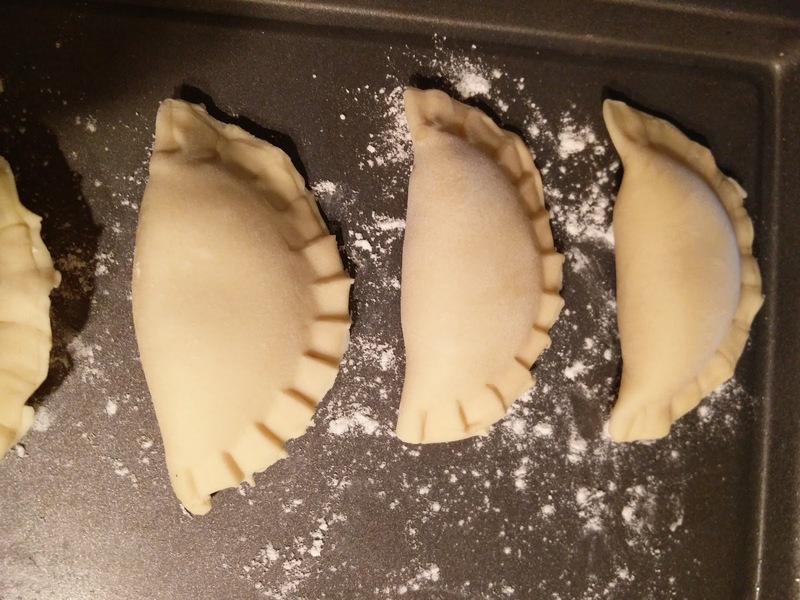 This was a first time making them for us, so we were not sure what dough recipe to use. We made two different ones. One with egg, the other without. We really think the egg dough was a better fit for these. We liked the taste of it better. We did not set out to make two different doughs. We only made one, but then had more filling and so made more dough...which resulted in leftover dough. We decided to stop at that point and not make additional filling :). 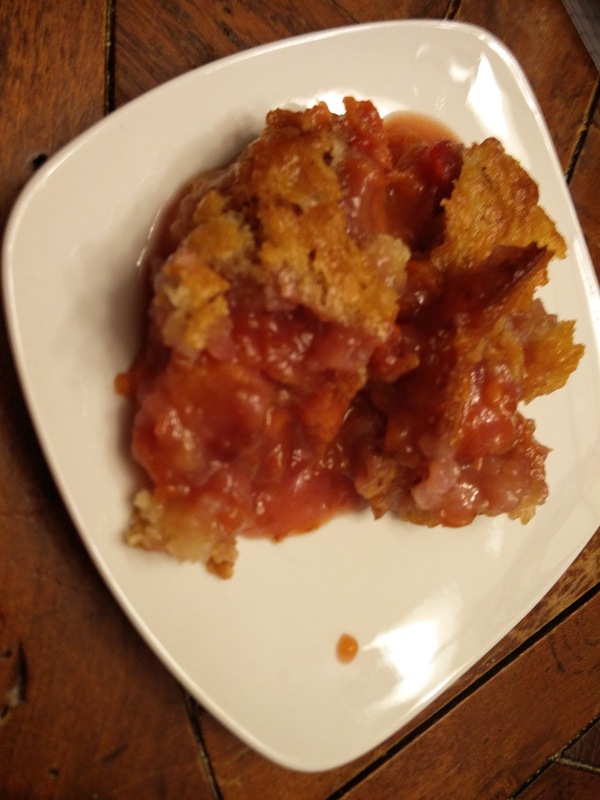 The interesting thing about these, is they can be very versatile and oftentimes can be filled with sweet filling as well such as cherries, apples, etc. They can also have a cheesy filling as well. Or, you can vary it up by adding different ingredients to your potato filling like chives, sour cream, cheese, chilis. The possibilities are really endless. 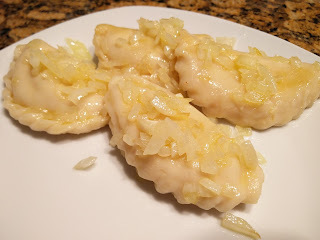 We chose to make these from a recipe book that was brought to us from a really good friend. Thank you! :) Picture of the book page is included below. 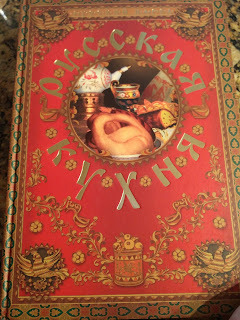 We did not have the kefir that the original recipe called for, so instead we used milk and egg. Water can also be substituted for milk. These are super flexible! 2. Fry the onions in olive oil until golden brown. 3. 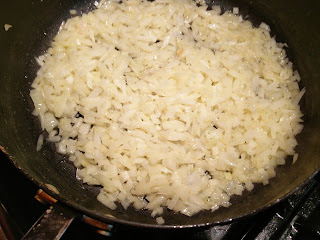 Mash the potatoes (we use our stand mixer with whip or paddle attachment), add in fried onions and all the oil and salt. The filling needs to taste good on its own, so make sure it is not under or over salted. 4. Roll out the dough into a large sheet. Cut out 3 inch circles with either a cookie cutter or bowl. 5. Place filling in each dough circle and fold in half. Pinch shut. Place on a floured sheet, careful not to overlap any consecutive vareniki. When filled, this sheet can be placed in the freezer. Once they are frozen they can be placed into a ziplock bag and kept in the freezer for a future meal. 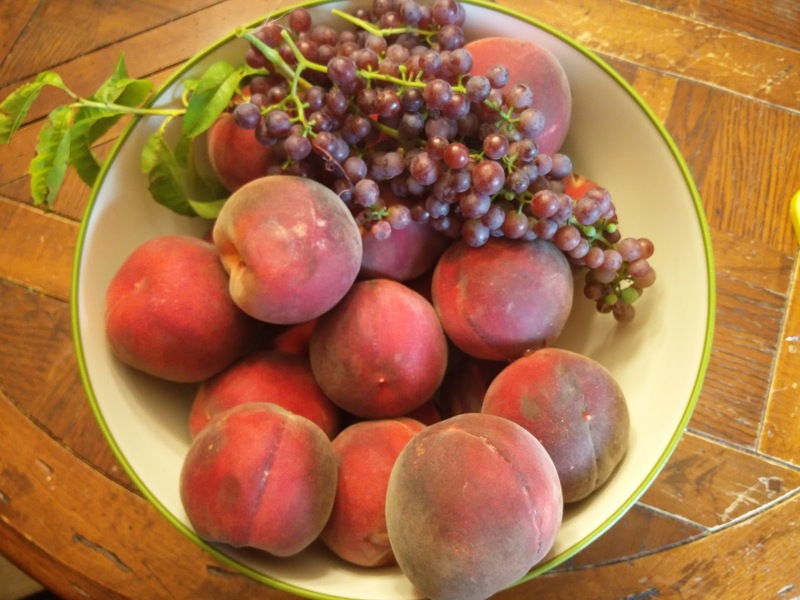 We usually freeze the first few sheets we make and cook the last batches to eat fresh. 6. Boil salted water in a large pan. 7. 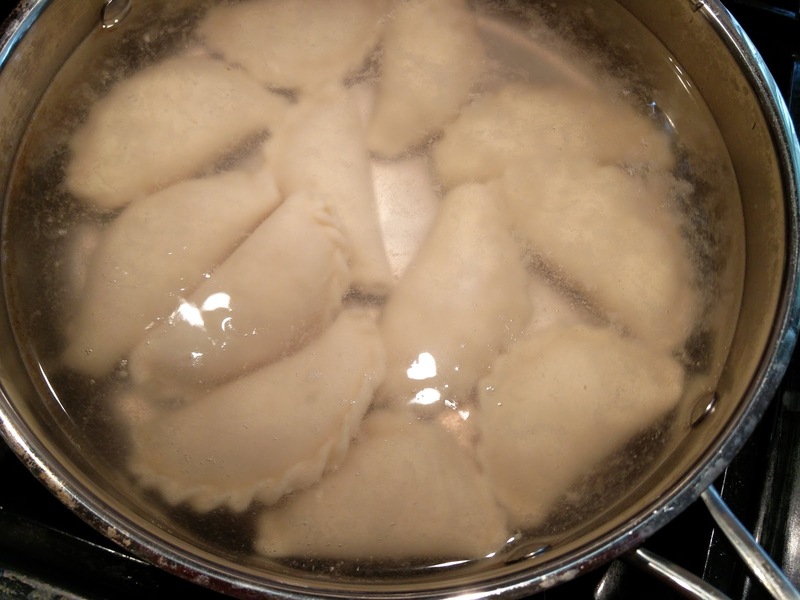 Add vareniki to the boiling water. 8. 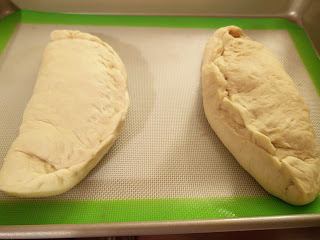 Once they float - cook for 5-10 minutes (depending on the thickness of your dough). 9. Meanwhile, fry the chopped onion with butter and olive oil. 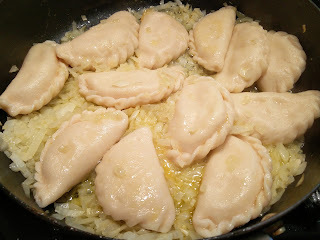 When the vareniki are done cooking, add them to the frying pan with onions until they are golden brown on both sides. These can be time consuming to make. He wasn't here when we made these. We were going to make easy calzones last night. We got the canned pizza dough and were just about to assemble them.. but, upon opening the can of pizza dough we realized there was no way we could use it. It was sticky, gooey, gross looking and smelling...something was wrong with it. And so, we resorted to making the pizza dough from scratch. We are SO glad we did that. The dough turned out perfect and it took only about 40 minutes for the dough to rise. Rolling out the dough was easy and simple. We should say we have had pretty bad luck making pizzas, something always happens, so we were very happy to find this dough recipe and make some delicious calzones! 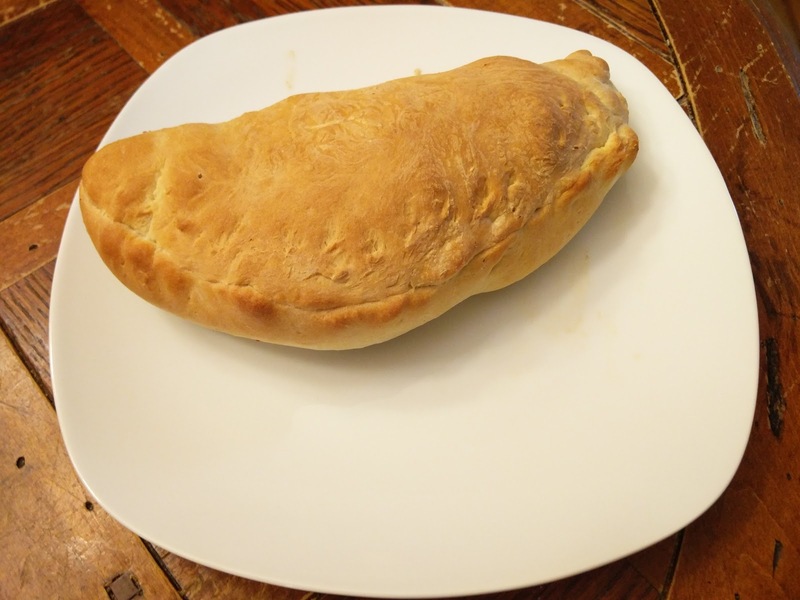 We were able to make a total of 4 calzones with the dough that we made. The options for the filling are really endless and you can adjust as you desire. Going in to the oven! 1. Make the dough by combining all dry ingredients in bowl of stand mixer. With dough hook attachment, start mixing. Slowly pour in water and oil. Continue mixing until a firm dough ball forms. If needed, add more flour. Cover bowl with saran wrap and let stand for an hour or until doubled in size. 4. Roll each one out into a circle. Add desired filling onto half of the circle. 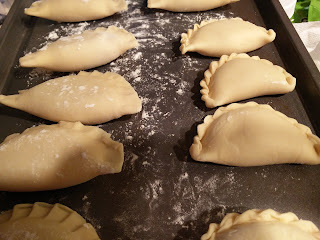 Bring the other half of dough over the filling and seal tightly shut. 6. Bake at 400 F for about 30 minutes. 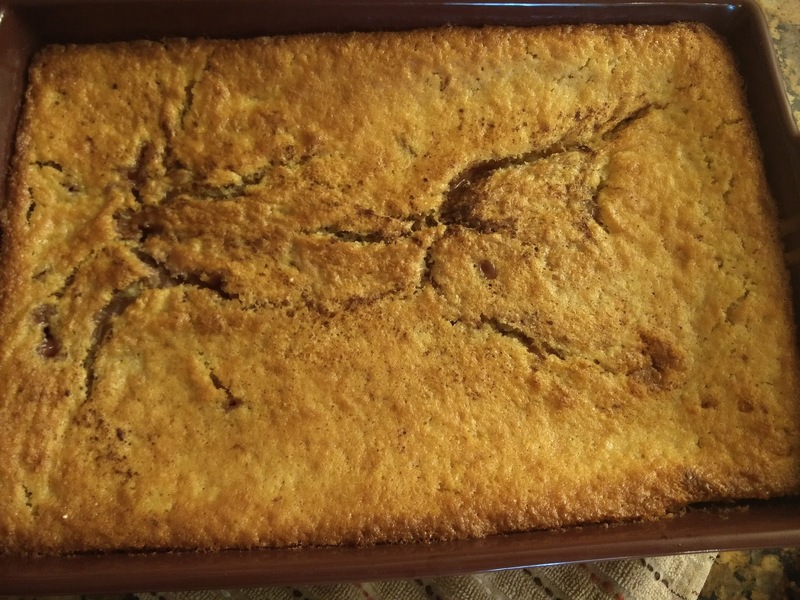 Yummy, easy and delicious! 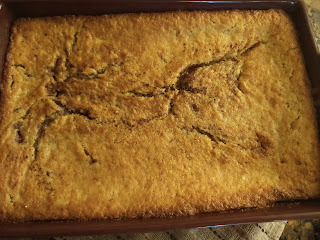 We used our silicon baking mats and that made cleanup sooo easy! Alona was not too thrilled with the ricotta cheese, so we actually made one just for her without it. 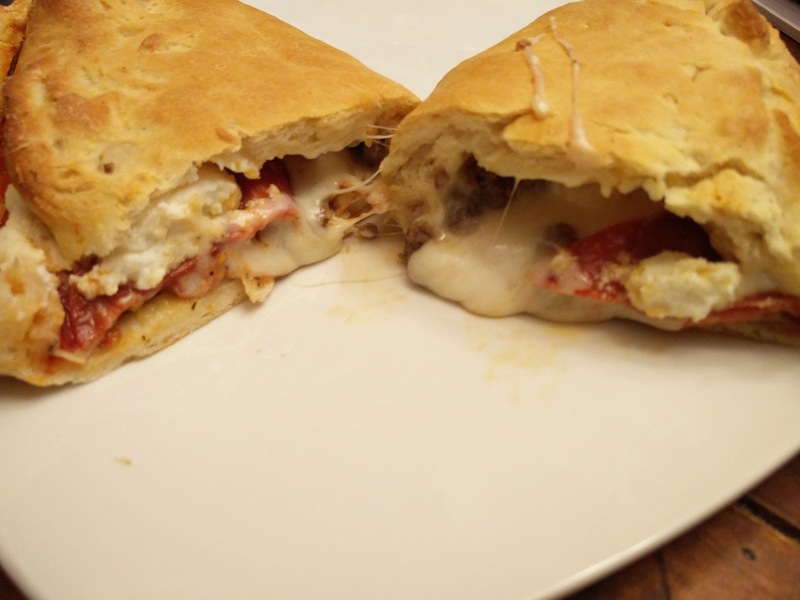 Also, not all the calzones were pinched tightly shut, so some of the cheese and filling leaked a little. Try different filling? Maybe black olives!?!?! We have posted a recipe with stuffed mini bell peppers before, but last night we made the full size version peppers of it. It was really good, although we didn't salt it enough, but adding it later was just as good. 2. Combine and mix the filling: ground beef, rice, carrots and onions, garlic, salt and pepper. 3. 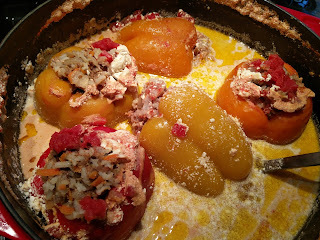 Stuff the bell peppers with as much filling as you can. 4. 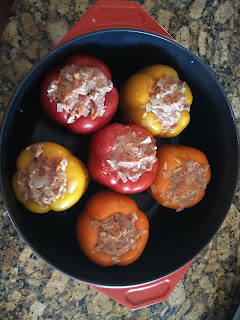 Arrange bell peppers in a large pan - we used our dutch oven. 5. Pour can of chopped tomatoes on top and top with 1 cup sour cream spread out over the tops of the peppers. 6. Fill with water until tops of peppers. 7. Bring to a boil, then reduce to simmer, cover and cook for an hour. 8. Serve with a dollop of sour cream if desired. Not enough salt :(, but it's easily fixed. Just add more salt - but we didn't really measure anything out this time around, so that's what we get! We were feeling in a Mediterranean mood, so we thought we would try to make some kofta kabobs. We were surprised at how easy they were to make and how yummy they were. We decided to pair them with some yellow rice with cherries and a quinoa salad. We didn't have the ingredients for a good sauce, and the tahini sauce was okay, but not the best to go with it. the yogurt/cucumber/dill sauce would be a better pairing for the kofta kabobs. 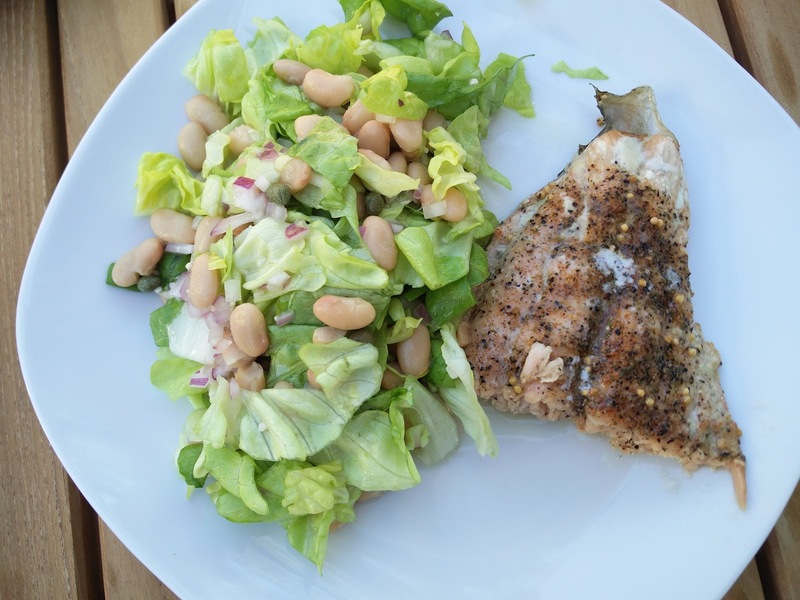 This is definitely a recipe we will make again soon. We only had ground beef this time, but a lamb and beef mixture would make this dish even better. 1. Soak 10 wooden skewers in water for an hour. 3. Add onion, garlic and parsley to a food processor and chop. 5. Remove the meat mixture from the food processor and place in a large bowl. 6. Divide meat mixture evenly amongst the wooden skewers, making a "sausage" on each one. 7. Place the kofta kebabs on the lightly oiled, heated gas grill. Grill on medium-high heat for 4 minutes on one side, turn over and grill for another 3-4 minutes. 1. Rinse rice until water runs clear. 2. Melt butter in a medium pot. 3. Add onions and cook until softened. 4. Add cumin, turmeric, cinnamon and garlic. Stir. 6. Add water, salt, pepper and heat until boiling. Reduce heat to low, cover and simmer until liquid is gone 15-18 minutes. After about 10 minutes in, add in the cherries. 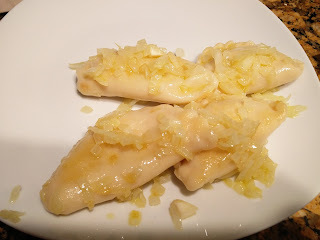 Soo easy and delicious! 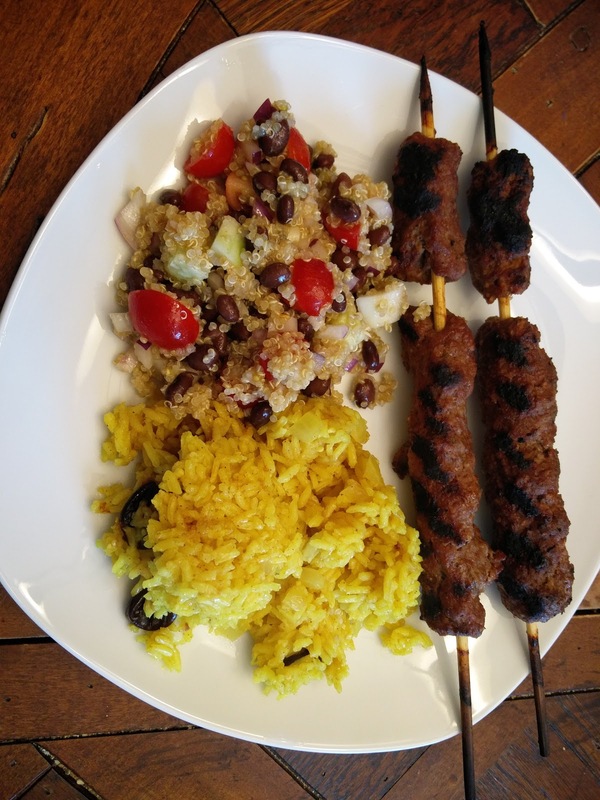 Better than restaurant kofta kabobs. The tahini sauce was meh, we should make a tzatziki sauce for it that would go better with. Also, a couscous side dish would be good. He actually really liked the rice, minus the cherries. This is one of the easiest, most satisfyingly chocolate-y desserts we have made! 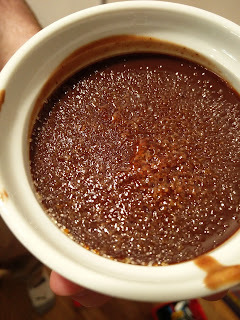 We were a little bit hesitant about the addition of chocolate to the creme brulee, but then decided to go for it. It turned out marvelous. So creamy, chocolaty and good! They also fridge well, and today we just had the last one topped with whipped cream - SOOOO good! because, you know... your creamy creme brulee just needs more whipped cream! :) But it's worth it, try it! These are all just out of the oven! Now to cool! 2. Combine heavy cream and 1/4 cup sugar in a small saucepan and heat over medium heat, stirring, until the mixture becomes to simmer. Add in chocolate chips and stir until melted and mixture is smooth. 3. Whisk the egg yolks with the 3 tablespoons of sugar in a medium bowl. 4. Pour hot cream mixture into the yolk mixture while constantly whisking. 5. Strain through a fine sieve. 6. 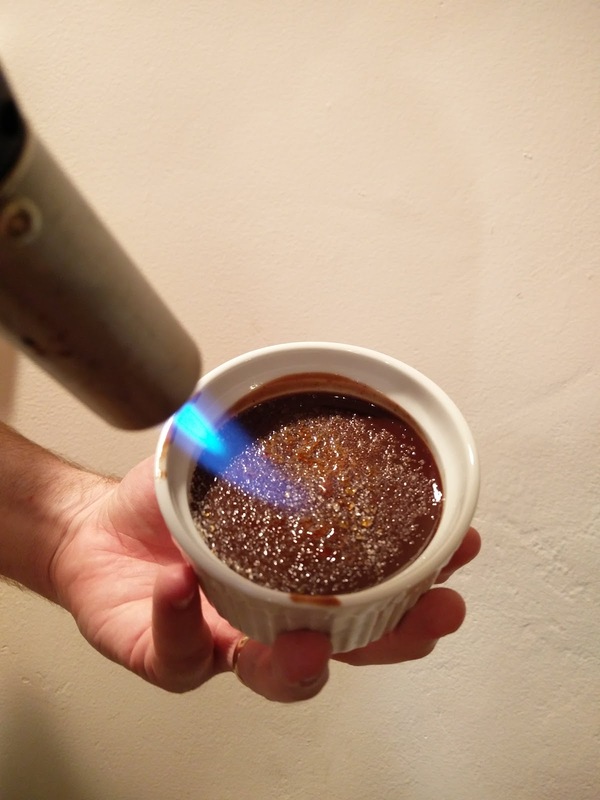 Pour the creme brulee into ramekins. We were able to make 4 large and 3 small ones. 7. 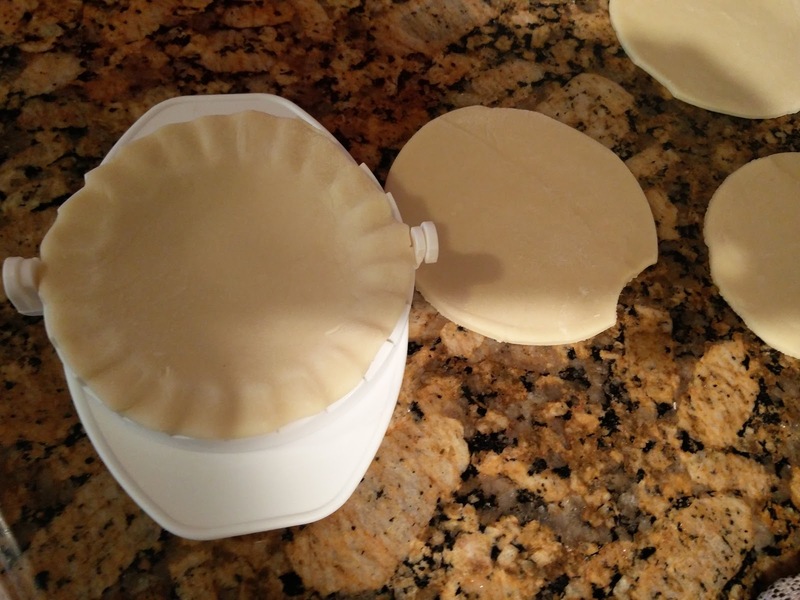 Transfer ramekins to a baking dish and fill with water about halfway up. 8. Bake for about 40-50 minutes until the custard sets. 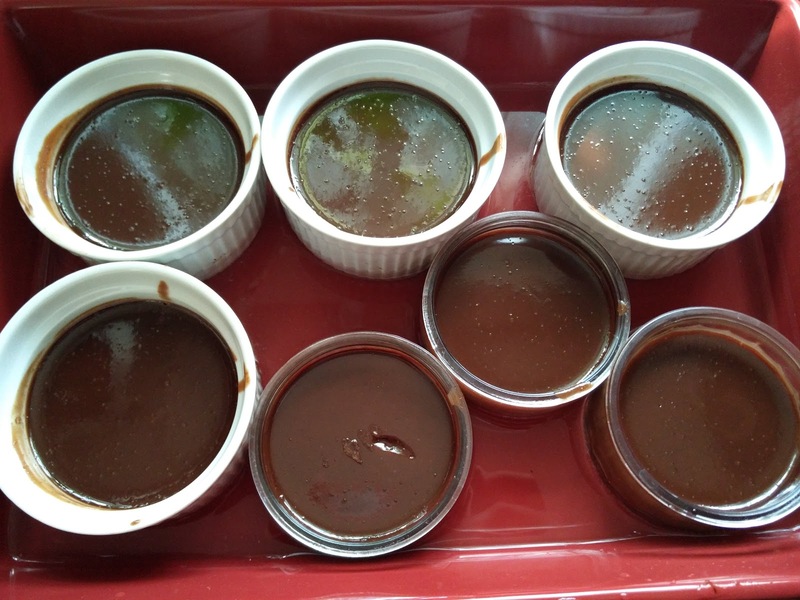 The time may vary based on the type of ramekins you use and how much you fill them. 8. Chill in fridge for at least an hour before serving. 9. 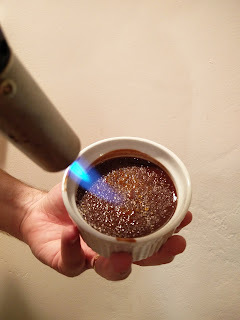 Sprinkle sugar on top and use a torch to create the caramelized sugar top. 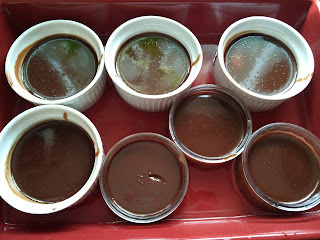 Soo good, choclatey and easy!